The Alaba International Market Traders’ Union, on Saturday, defied the sit-at-home order by the Movement for the Actualisation of the Sovereign State of Biafra (MASSOB). The pro-Biafra group had directed Igbos all over the world to stay in-doors and mourn Igbo natives, who had lost their lives to the Boko Haram insurgency. However, our correspondent, who monitored the situation in the Alaba Market, reports that the MASSOB order was ignored as the businessmen and women went about their normal duties undisturbed.The police had a few days earlier urged the union in the market to ignore the order, vowing to deal decisively with any group that disrupted the peace in the market. There was no unusual movement of security agencies as policemen remained at their normal posts while business went on smoothly. 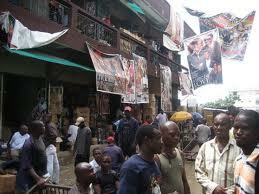 Traders in Alaba defied the MASSOB sit-at-home order. Few stalls in the streets were locked but commercial activities were booming throughout the day.